Creates room for larger wheel and tire packages. Includes Steel spacer and all hardware needed for installation. Your Full Throttle Suspension Leveling Kit is backed by a Lifetime Warranty. 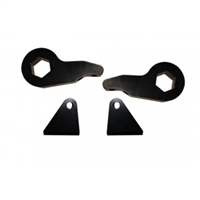 It's the fastest, safest and easiest way to get the extra 2" of clearance your truck needs. 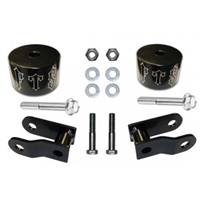 Full Throttle Suspension Leveling Kit components are created from durable steel. Full Throttle Suspension will not sag or wear out like a urethane leveling kit. Full Throttle Suspension Leveling kit can be installed at home with moderate mechanical ability and a couple hours’ time. 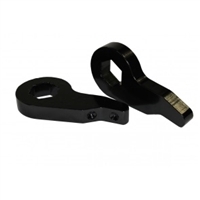 It's the fastest, safest and easiest way to get the extra clearance your truck needs. 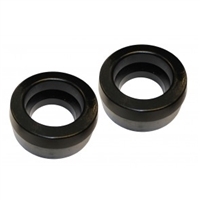 Full Throttle Suspension Leveling Kit components are created from durable steel. Full Throttle Suspension will not sag or wear out like a urethane leveling kit. Full Throttle Suspension Leveling kit can be installed at home with moderate mechanical ability and a couple hours’ time. Steel Spacer –will not sag like urethane. All parts are powder-coated black to keep from corrosion. Your Full Throttle Suspension Leveling Kit is backed by a Lifetime Warranty on manufacture’s defects. 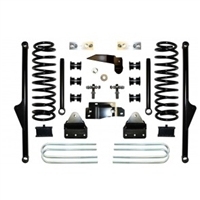 When you want the look of 35" tall tires without the hassle of an expensive lift kit, take a look at Full Throttle Suspension's Leveling Kits. It's the fastest, safest and easiest way to get the extra 3" of clearance your truck needs. 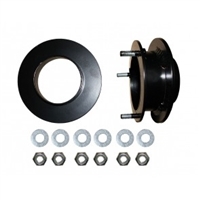 All LEVELTECH by Full Throttle Suspension Leveling Kit components are created from durable steel. Full Throttle Suspension Leveling kits can be installed at home with moderate mechanical ability and in a couple hours’ time.